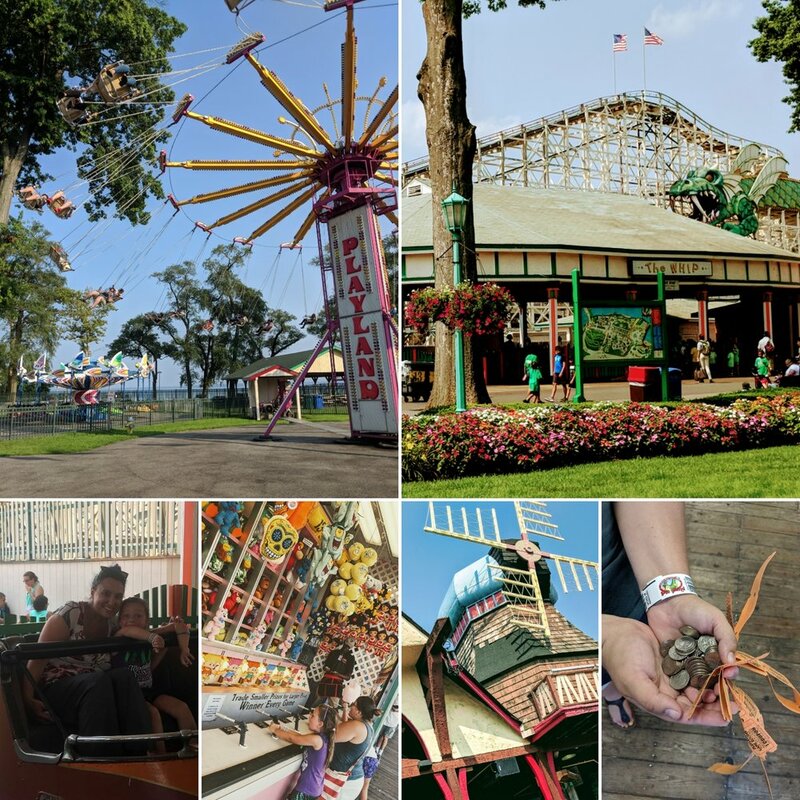 Growing up in Westchester County, Rye Playland has been a summer staple all my life. I am proud to share it with my daughter, as well as introduce it to out of towners. To me, this National Historic Landmark is one of New Yorks greatest gems. This year, Playland celebrated its 90th year in operation. It opened in 1928, and its iconic Dragon Coaster opened one year later. Today, it is one of only about 100 wooden roller coasters left in the country. It also boasts an impressive collection of rare, vintage rides including The Old Mill, a tunnel of love style boat ride that has had several incarnations over the decade. Currently it is a mining adventure that is fun for all ages. There are two colorful haunted mansions, The Flying Witch and Zombie Castle, that hold more laughs than scares, but are a much appreciated throw back to boardwalk and carnival staples of eras past. You'll also find The Whip, a big and mini YoYo, dozens of classic arcade games, and a 1915 Mangels-Carmel Grand carousel. The carousel was badly damaged in a fire last season, but it is being restored and will hopefully be ready to ride in the 2019 season. My favorite of all the vintage rides is the Derby Racers. It is one of three left in existance. Riders saddle up, put one foot on the top rung, lean to the left, and take off on the horses that move back and fourth as well as up and down as they circle the track. They are only going 25mph, but as a young kid with the wind in your hair, and the roaring galloping noise of the attraction, it can easily make you feel like you are in the Wild West.... or traversing the fields of Hyrule..... or just speeding away from anything trouble you. The heart of Playland is its Kiddie Land. It has hardly changed over the years, and never ceases to please the generations of children that visit to enjoy the rides their parents did. Playland has also featured in numerous movies, tv shows and music videos. Most famous is likely Big. Due to this fame, it is impossible for many to visit without a token photo next to a Zoltar machine. It was recently featured in an episode of Orange is the New Black. Many rides have come and gone. I have heard many of my elders lament the Airplane Coaster, which closed decades before I was born. The biggest loss to me was The Mind Scrambler, a classic scrambler ride, that put riders in a mirror lined tent, under flasing christmas lights, while blasting pop hits at them and freezing them with an air conditioning system so powerful that penguins would celebrate. The thing about Playland is despite its losses, it has maintained so much of its original character and decor. It celebrates its history, while also bringing in a handful of great new attractions. When Playland was built, there were many summer resorts dotting the shores of the East Coast. The Gold Coast. These were summer havens from the blistering heat, constant noise, overwhelming smells and heavy pollution of New York City, Boston and Philadelphia. They were characterized by their grand beach front hotels, elongated Boardwalks, amusement parks, entertainment pavillions and oversized pools. Rye was once one of these vacation hotspots. At the turn of the 20th century, before the days of Playland, the waterfront area was alive with hotels and family amusement areas. The area had attracted some unsavory characters to its bars to solicit naughty evening activities, which upset the posh local residents. Their response was to ask the town to build a large, government operated amusement park where all these folks could gather to get their kicks, making it easy to ID and track them. The architect, Frank Darling, who had worked for Coney Island, a huge deal at the time, was hired to design and run Playland. In addition, the NYC architectural firm Walker & Gillette and landscape architect Gilmore D. Clarke were brought on to design the buldings and grounds. Many of which stand today. As technology, transportation advances, and desire for international travel made the world a smaller and smaller place, many resorts like Rye Playland fell by the wayside. Most have been razed to the ground to make room for waterfront condos or commerical areas. So far, Rye has rebeled against this fate, and maintained this tiny bubble, a turn of the century fantasyland both inside the park and its surrounding area. Outside the gates of Playland park, you will find a well maintained Boardwalk which remains one of the most picturesque spots in the county for a stroll. Or evening swing dancing on some nights.There are two beaches, Playland Beach and Oakland Beach, two restaurants, and a stunning Ice Casino that is still very much functional. The New York Rangers used to practice here, and in its past it also featured a dance hall and fine dining restaurant. They also recently completed restorations on the giant public pool that had fallen victim to years of neglect. It is now in fine form again, glistening in the sun, overlooking the beach and ocean. It is an absolutely stunning piece of art deco arcitecture. The Westchester Childrens Museum is also on the Boardwalk and open year round. Playland is one of the few county run amusement parks left. It hasn't always been financially stable and there have been long running squabbles, power grabs and legal battles regarding its future. It has survived hurricanes, fires, recessions, competition from gigantic theme parks, and evolving appetites for thrills. Its still standing, and I hope that it always will. If you are ever passing through the greater NYC area, make Rye Playland a stop. I promise it will touch your heart.